Organic has taken over the world by storm, and now your cat can have organic cat food too! They deserve the best, and there’s nothing better than all natural, organic, no-GMO, cat food. But how do you find the best organic cat food when everything seems to be a good option? You compare them side by side as we did! You should carefully consider the ingredients of your organic cat food before committing to that particular diet. But, we looked at what would make up the best organic cat food recipes, and everything had to do with ingredients. Carefully weigh these aspects before you decide with cat food is best for your fur baby! The dark truth behind anything Organic lies in the labeling. Unfortunately, not everything that claims itself to be “organic” actually is. 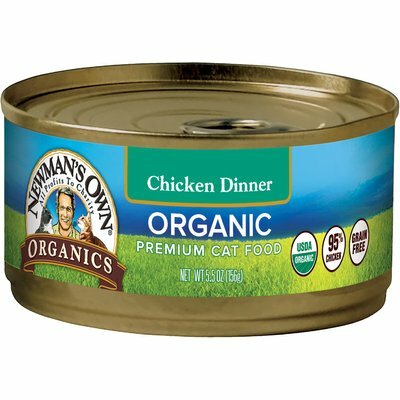 Many “organic” cat food options use chemical ridden, over-processed ingredients. But, the USDA organic seal serves as proof that not only did the manufacturers go through the care of crafting an organic recipe, but that they also made sure to have a formal, third-party, review the food! The USDA organic seal is something that should be on every quality organic cat food, and if it doesn’t have it, you should look for a different option. Organic doesn’t mean much if you’re still giving your cat mostly corn or wheat in their diet. The key to the best organic cat food options all lie in quality ingredients. To get the best for your cat, you’ll need to learn how to read the ingredient’s list on cat food products. Just like nutrition labels on human foods, the ingredients are listed in the order of what makes up most of the recipe. Because cat food is made in large batches in factories, it’s important to note the protein, fat, and fiber percentages. Then you must link these percentages to the associated ingredients. Many fur parents find that they’ve been paying top dollar for premium cat food and it’s full of pea protein and rice. Although neither ingredient is necessarily wrong, you wouldn’t imagine that an organic cat food that’s $60 per bag is peas and rice. So, what should you look for? Proteins such as fish, chicken, turkey or beef. You should also look for additional proteins such as soy, egg, and pea. But after checking out the protein, you should evaluate the vegetable or fruit ingredients. Some of the most nutrient ingredients include pumpkin, blueberries, sweet potato, and kelp. Protein meal and protein by-products are the equivalents of chicken nuggets which suffice to say are why cat’s love these foods. But, we can’t eat chicken nuggets every day, and it’s not reasonable for our cats to eat this type of food every day too. Meal and by-product simple don’t stand to the definition of organic. Organic means that the food has been made without pesticides, sewage sludge, GMOs, radiation, ionization, synthetic fertilizers and that the animals weren’t given antibiotics or growth hormones. Unfortunately, when it comes to meal and by-product, there’s no real assurance that the meal or by-product is entirely made up of doesn’t contain any of the above ingredients. 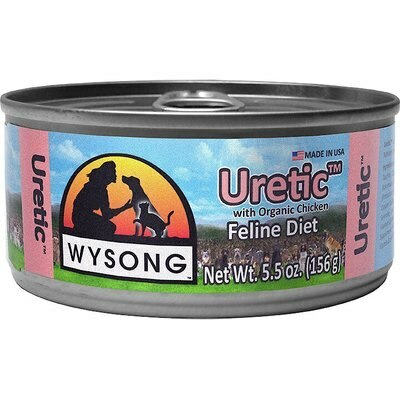 Wysong uses a unique blend of ingredients that don’t add up to the average cat food. Although they use chicken, brown rice and blueberry, you’ll find unexpected ingredients such as chicory root and rosemary which not only helps the food be more enticing to picky eaters but is full of nutrients as well. We like that they stayed away from the standard wheat and corn-based fillers. Although they use rice, it’s a much healthier carb option than grain fillers. Instead, they use organic barley grass powder and dried kelp to act as a dark green filler ingredient. The only downside to this organic food is that there’s no USDA Organic label showing that the ingredients and recipe were reviewed by a third party. Although Uretic has an outstanding reputation for manufacturing only the best, that’s unfortunately not enough for organic claims. We enjoy this recipe and the size of the cans. The organic chicken base makes it a high-protein diet for your pet. The brown rice will help keep your cat full which can be a problem with an organic diet. Veterinarians designed this formula to have a lot of protein from quality sources. The macro and micronutrient build help urinary tract systems and immune systems operate at their best. It’s also shown to improve energy levels in sluggish cats. Castor and Pollux are among the premium brands that emerged to improve the perception of pet food. With this formula, Castor and Pollux use only top of the line, organic chicken with sweet potato, peas, and chickpeas. This blend of meat and non-meat proteins create a formula that is 32% protein and 3.5% fiber. Although it’s dry food, it contains 11% moisture. The moisture in this dry food is pretty outstanding. Although it means it won’t last as long in your cupboard, it will help your cat stay hydrated compared to other dry foods. But the ingredients list is also worth mentioning as a huge benefit! There’s nothing to dislike about this recipe. Although it’s a dry food which means that your cat is at risk of losing out on moisture, dry food can also help dental health. This formula is full of organic ingredients and provides a quality mix of fiber, fat, and protein. From organic salad dressing to organic cat food, Newman’s Own offers high-quality ingredients with thoughtful recipes. The organic chicken makes up 95% of this recipe, and the rest is organic chicken broth and dried eggs. We enjoyed the fact that the recipe is 95% chicken. There’s a lot more than pet food companies add to their formulas to try to avoid using such costly ingredients. But, Newman’s Own uses dried eggs and vitamin supplements to fill up the last 5% of this recipe. The only downside here is that the formula is extraordinarily low in fiber. The crude fiber is about 1% which for some cats can lead to urinary health problems as well as skin problems. This issue could lead a pet parent to choose another option. If your cat is happy and healthy without any urinary problems, this could be a top choice for organic cat food! The organic chicken is a healthy and nutrient-rich protein, in this formula, it stands out as a solid foundation. Unfortunately, the protein choices with a lack of vegetable or fruit addition bring the fiber so low that any cat susceptible to urinary tract health may develop further issues. If you’re looking for a high fiber diet, this is not a great choice. With the first ingredient of chicken and the addition of antioxidant-rich alfalfa blend, there’s a wholesome and well-rounded nutrient build for any cat. Made for all life stages, and presented in a pate form, any pet parent would be very happy with this organic option. There’s also the addition of vitamin supplement to fill in the few nutritional gaps. Every ingredient is non-GMO, grain-free and organic. There’s the presence of high levels of omega 3 and omega 6 fatty acids which can aid skin as well as coat health. The best thing about this version organic cat food from Castor and Pollux is that there’s a focus on promoting healthy living among our fur babies. The all-life stages formula has supplements and oils that help digestive health, urinary tract health and skin care. As we’ve seen with other wet cat food options, the fiber in this recipe is very low. The crude fiber content is about 1%, and this is so low because there are very few nutrients from fiber-rich ingredients. Although there are vegetables and berries in this recipe, they aren’t enough to boost the fiber. 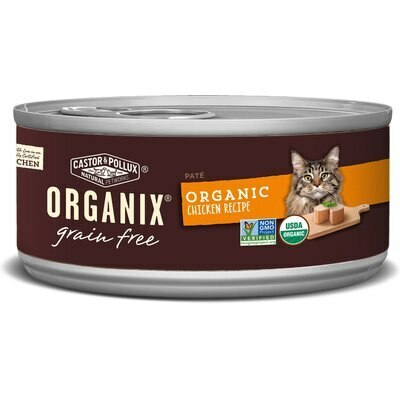 If you have a happy and healthy cat that simple deserves a higher quality of food than what they’ve had before, than Castor and Pollux Organix Grain-Free Organic Recipe for all life stages is one of the best options. The supplements include amino acids, potassium, taurine, ash, and calcium. The brand keeps up its reputation for focusing on high-quality ingredients. The vegetables present, although not fiber-rich are nutrient dense. Cranberries in this formula can make this recipe an excellent choice for pet parents who have cats that suffer from urinary infections or elderly cats. It’s not often that you see labels that mark any food as sourced from USA sourced ingredients with GAP certification as well. All the chicken used for Tender and True formula is humanely raised, and organic. The recipe is grain-free, soy free, and does not have any artificial flavors or coloring. Preservative-free and made for all life stages. The top 2 ingredients are both organic chicken and organic chicken meal. While there are always some questions about the chicken meal, the USDA certification ensures that the chicken meal present here is also organic. Looking at the top 2 ingredients always helps guide our decisions on finding the best organic cat food. But, the second best thing about this recipe Is the high fiber content. The biggest problem that is commonly reported with this food is that cats just don’t like it. Cats are known far and wide for being picky eaters, and there’s not always a good explanation for why cat’s dislike a morsel of food. If you don’t have a picky cat, this formula is excellent. Unfortunately, and we’re not sure why picky cats tend to avoid this food. The recipe is well thought out, and there’s a lot of care taken into choosing high-quality ingredients. The ingredients here are from USA farmers, with the food that ends up in these bags made in the USA as well. The ingredients include chicken, tapioca, and peas. They avoid all types of fillers from grains to corn. There’s even an exceptionally high fiber count of 6.5% which is outstanding for an organic formula! 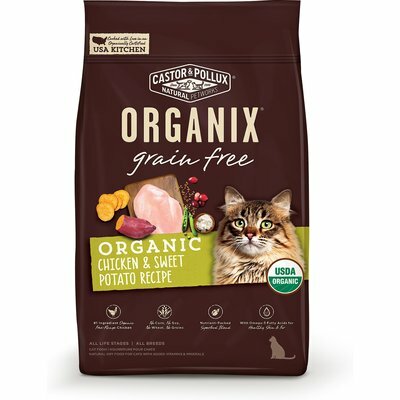 The clear winner of organic cat food list that we have here is the Castor and Pollux Organix Grain-Free Organic Chicken and Sweet Potato Recipe Dry Cat Food. Everything in the recipe is organic, even the chicken meal! The formula holds a USDA Organic certification which makes it a prime choice for any pet owner. Treat your fur baby with this blend of chicken, sweet potatoes, peas, and chickpeas. The formula is made to keep cat’s skin, coat, and urinary tract in top-notch condition. Best of all, there’s no grains, chemicals, or artificial preservatives or colors. Finally, Castor and Pollux choose only quality ingredients. The use of superfoods and the care that goes into this recipe is outstanding. Without a doubt, Castor and Pollux are the best organic cat food available and is an excellent choice for many pet parents.